Photonic crystals, the optical equivalent of semiconductor chips, make it possible to channel light waves through very small spaces. They promise fast, all-optical computers and highly efficient communications devices. But it's hard to make crystals that can handle multiple wavelengths of light at once. A new approach is all about keeping things in proportion. The shared audio space of teleconferencing is a limited structure that makes it difficult to have more than one conversation at a time, and even harder for someone to hold one conversation while keeping tabs on another. Software that tracks who's talking to whom gets the conversations flowing. When making molecular memory, a light touch is usually called for. The harsh metal processing used to make electrical contacts often punches holes through the delicate layer of molecules. 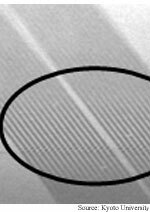 Gently laying down nanowires boosts yields of the devices. One way to tell how much strain a building is under or how big a blow it has taken during an earthquake is to build sensors into key joints and walls. A relatively simple device made from aluminum wire makes for a sensor that draws no power and can be read wirelessly. See-through circuits closer... Protein traps nanoparticles... Nods drive audio interface... Nano rapid prototyping advances... Practical nanotube fiber near... Nanotube transistors make memory.